When I made besan laddu for the first time, it was a great flop. The gram flour I used was not roasted properly and because of it, all the laddus directly went to the bin. but, next time when I prepared it, I was very careful in roasting part and too cautious for not making the same mistake again.This time, I made perfect, tasty besan laddus. So make sure to roast the gram flour properly and thoroughly to avoid the raw smell of the gram flour while eating. 1) Mix both sugar and cardamom in a mixer and make a powder of it. Keep it aside. 2) In a kadai / wide pan, mix basen, rava and dry roast for few minutes. Add ghee to this mixture and continue roasting for few more minutes in low flame. 3) Initially the mixture looks crumble. 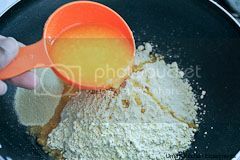 If you keep on mixing it, you can see that the crumbled mixture will bind together and not sticking with the pan. When the besan mixture turns light golden brown and not sticking with the pan, remove from the pan. It took 10-15 minutes for me as I did it in very low flame. 4) Transfer the mixture to the bowl. 5) When the mixture is warm, add sugar, cardamom mixture (as said in step 1) and almonds. 6) Mix it well and start making laddu. I made laddus when the mixture is warm to make perfect shaped laddu with the help of melted cold ghee. 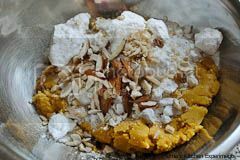 7) Once you are done with making laddu's decorate it with crushed almonds or pistachio. 8) Cool to room temperature and store in a container. 1) Roasting part of the besan is important and make sure to roast it correctly for perfect tasting besan laddus. 2) If you are not able to form laddu shape, add little more warm ghee to act as a bind factor. Use very little quantity. 3) Increase or decrease the almonds as personal preference. Yummilicious :) Looks sooooo delectable!! Looks delicious and perfectly made,when I made it first time 8 years before it was a big flop then it came out nice...Its been ages since I made this ladoo. one of my fav ladoo :)thats a visual treat to me..
Ladoos looks so delicious and mouthful. Wonderful preparation. Thanks for posting this recipe. I love besan ladoo. Looks perfect. so well made. I love this. generally I make this in Micro but for bigger quantities resort to stove top. Looks really yummy & fantastic.. Healthy and delicious ladoos..Nice presentation too. The besan ladoos look so perfect..have to try this one. Thanks Azia for trying it out and letting me know the feedback.